The Northern Cape is a province of dramatic geographical contrasts, from barren flatlands, rugged and rocky landscapes to the most gorgeous green vegetation with kilometers of vineyards. The Northern Cape is truly a province that produces. It is renowned for its wine, as well as wildlife, cattle and sheep farming, table grape and raisin production, vegetables, citrus, Lucerne, olives, pecan nuts, wheat and cotton, and of course famous for its diamonds. With the mighty Orange River twisting through the Northern Cape, it transforms the area around it into one of the best wine regions of South Africa. It provides essential irrigation and most important (especially for this region in South Africa) it cools temperatures. The Orange River provides a “meso-climate”, which produces grapes and wines of immaculate sensory balance. The natural acids and low pH values provide great flavor qualities. 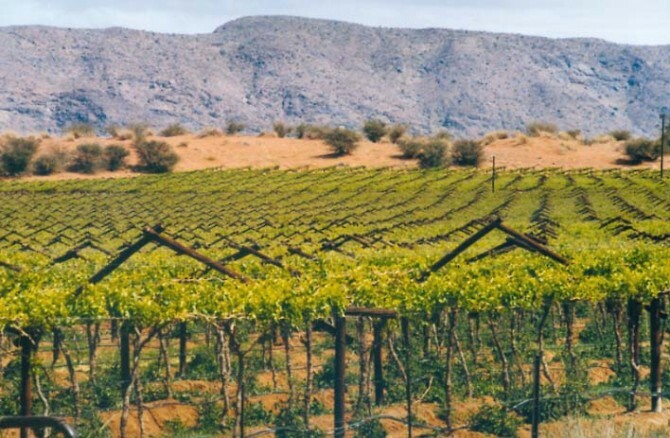 The Northern Cape wine region along the Orange River includes the hottest wine producing areas in South Africa, which makes for the exquisite wine it produces. The Orange River Wine Cellars was established in 1965. It is probably the most famous Cellar in the Northern Cape, with good reason. Upington Cellars harvested wine grapes for the first time in 1968, and from there the Orange River Wine Cellars expanded with cellars in Groblershoop, Grootdrink, Kakamas and Keimoes, and today all of these cellars are flourishing. Orange River Wine Cellars now have a new brand as well, Orange River Cellars. This comes with new elegant and stylish packaging as well. After all, they are representing the wonderfully unique Northern Cape wine region. The Ultra Liquors Best value Wine Guide is regarded as the leading guide for consumers and retailers. Here you can discover wineries of the best quality at an affordable price. Orange River Cellars was named the Best Value Cellar in South Africa, with five of its wines garnering Best Value Status. These five wines include the Rose 2010, Colombar 2010, White Muskadel 2009, Red Muskadel 2009 and White Jeripigo. The Soet Hanepoot and Sparkling Brut of Orange River Cellars also made the Best Value Wine Guide.